I was raised, like many of my generation, on balanced meals and The Beatles. Even though they had stopped making music by the time I was born, they were of such great importance to my mother that a deep love of the band was passed on to me, which makes playing The Beatles: Rock Band a total joy. There are some who claim that they don’t like The Beatles. To that I say: poppycock! The Beatles have such a large and varied library of songs and such a palatable sound that I find it hard to believe that anyone would reject them out of anything other than pointlessly hip iconoclasm. Whether one is a Beatles fan or not, it is hard to deny that The Beatles formed the foundation of pop and rock music today. So much of what we take for granted now, like verse-chorus-verse-chorus-bridge-chorus song structure and three minute singles for radio play, was set into place by The Beatles over their wildly successful career. They changed music. They made rock and roll popular across the universe. This last week, The Beatles: Rock Band was released by Harmonix, the creators of the original Guitar Hero and Rock Band (the new Guitar Hero games are now made by rival company Neversoft). 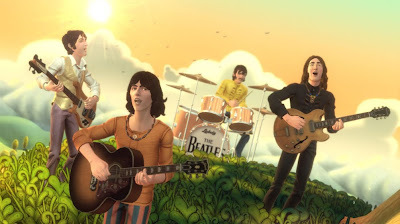 Unlike other music games focused on individual bands, The Beatles: Rock Band only uses tracks performed by the titular band, and does not include any covers or music inspired by the band. In opting for such a narrow focus, Harmonix beautifully reconstructs and mythologizes the career of The Beatles, from the Ed Sullivan Show to the final rooftop concert in London. The game provides plenty of material for new and old fans alike, through beautiful visual representations of songs, animated interludes, and unlockable secrets. By progressing through the game, players will find rarities like the 1963 Beatles Christmas Record or an early video of the band goofing around on a train during their first US tour. The love and care that has gone into the crafting of this game is abundantly clear. The people at Harmonix are incredible talents as well as enormous fans. While The Beatles: Rock Band is primarily a beautiful tribute to a well-loved band, it is also designed to bridge the gap between two generations. The game explains itself to those unfamiliar with music games and their new controllers, even going so far as to include a sheet that explains how to hook up a console to the internet to download songs. The “Easy” mode of gameplay automatically makes it impossible to fail a given song, and it includes a training mode for the drums. In a way, much like The Beatles taught a generation about a new kind of music, The Beatles: Rock Band is now teaching them a new language, one familiar to those of us who have played music games before. I get the sense that video game fans the world over are hoping that this game will continue to bridge the gap between video games and popular culture, pushing the medium further into the mainstream. When The Beatles first came onto the scene, they changed the world of music forever. Having risen in popularity throughout the 40s and 50s, Rock and roll was not a new genre, but when The Beatles rose to fame it was clear that rock and roll was a worldwide cultural phenomenon. Similarly, video games have been gaining traction in recent years, becoming more and more a part of popular culture. Does The Beatles: Rock Band do for video games what The Beatles did for music? With the music game genre losing some of its initial luster and sales, one can’t help but wonder whether The Beatles: Rock Band is the Ed Sullivan Show for video games as a whole, or the rooftop concert for the music game genre. The Beatles and video games have come a long way over the years. It’s good to see them come together, right now, and so spectacularly. Happiness is a warm controller. I'm looking through the critics. It's a ticket to ride through the band's history. That is only a glimpse into that particular well of madness. Anyhow, I'd like to say thank you on behalf of myself, and I hope I passed the audition. Congratulations on yr will-power (those are truly awful)! Also, man, is this game fun to play. >It took every fiber of my willpower to resist littering this review with Beatles song references. Edit: Ah, the first half of that parity is better than the second half. I fear I was raised on pointless iconoclasm in much the way you were raised on The Beatles, but I'd argue that a lot of what the Fab Four get credit for was built along with and on the shoulders of others (others who, in turn, were both icons in their own right and built on the genius of previous musicians). I certainly wouldn't mind a Rock Band: Icons that hit only the big names of the 50s, 60s and 70s, showing a similar trajectory to the Beatles game, but from a wider perspective. Elvis to The Clash sounds great to me. That said, I do love (good?) puns. Looks like I botched TypePad again. I fear I'll never figure it out. Thanks for your take on this, Daniel. Your erudition is only exceeded by your sharp cultural eye. I look forward to playing this simultaneously hot and cool game. As one of mother nature's sons, you've spent another day in the life quite well, I see.